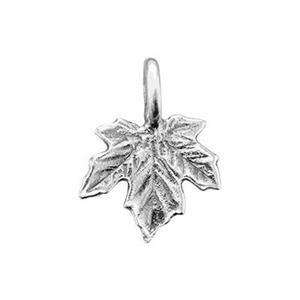 Don’t let Autumn “leave” you without purchasing our S1289 - Bright Sterling Silver Cast Maple Leaf Drop! Perfect for your Fall designs – whether using it in your earring or necklace designs! The ring has an inside diameter of 2.4mm which will easily accommodate our 2.2mm and smaller Sterling Silver Footage Chain. My customers love these quality SS charms for fall. Look great w/Swarovski crystals!